Synthetic peptide corresponding to Human DIS3L2 aa 121-170 (N terminal). Our Abpromise guarantee covers the use of ab50848 in the following tested applications. WB Use a concentration of 1.25 µg/ml. Detects a band of approximately 63 kDa (predicted molecular weight: 69 kDa). Good results were obtained when blocked with 5% non-fat dry milk in 0.05% PBS-T.
ELISA titre using peptide based assay: 1/62500. Ribonuclease that plays a critical role in RNA metabolism. It is essential for correct mitosis, and negatively regulates cell proliferation. Defects in DIS3L2 are the cause of Perlman syndrome (PRLMNS) [MIM:267000]. An autosomal recessive congenital overgrowth syndrome. Affected children are large at birth, are hypotonic, and show organomegaly, characteristic facial dysmorphisms (inverted V-shaped upper lip, prominent forehead, deep-set eyes, broad and flat nasal bridge, and low-set ears), renal anomalies (nephromegaly and hydronephrosis), frequent neurodevelopmental delay, and high neonatal mortality. Perlman syndrome is associated with a high risk of Wilms tumor. Histologic examination of the kidneys in affected children shows frequent nephroblastomatosis, which is a precursor lesion for Wilms tumor. Belongs to the RNR ribonuclease family. 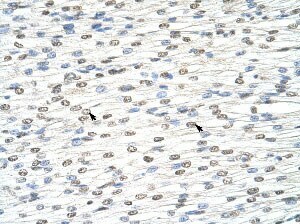 Immunohistochemistry (Formalin/PFA-fixed paraffin-embedded sections) analysis of human heart tissue labelling DIS3L2 with ab50848 at 4-8µg/ml. Arrows indicate positively stained human myocardial cells. Magnification: 400X. ab50848 has not yet been referenced specifically in any publications. Publishing research using ab50848? Please let us know so that we can cite the reference in this datasheet. There are currently no Customer reviews or Questions for ab50848.